Earlier in the month I tried out my first fish recipe in a long time. Unfortunately I couldn't get fresh cod, but frozen cod fillets seemed to do the trick very nicely. I really enjoyed this dish. 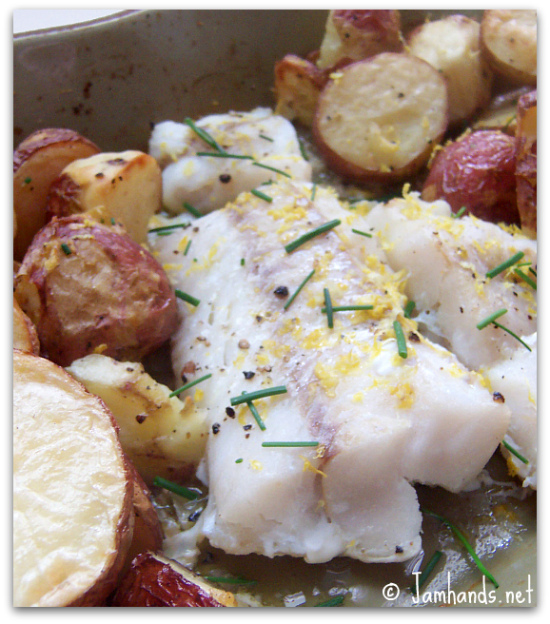 It has simple ingredients that don't overpower the flavor of the fish. It is also a very basic sort of recipe that would be great for beginner cooks. A splash of fresh lemon juice at the very end gives it a nice zing. 1. Heat oven to 450-f degrees. Place the potatoes in a large roasting pan. Drizzle with 3 Tbsp. of the oil and toss to coat. Sprinkle with 1/2 tsp. of the salt and 1/4 tsp of the pepper. Roast for 20 minutes. Stir and roast for additional 10 minutes. Meanwhile, rinse the cod fillets and pat them dry with paper towels. Real Simple Tip -- Serve with malt vinegar for the adults and ketchup for the kids.